Hatters boss Nathan Jones has warned his players not to take Yeovil Town lightly this evening despite their lowly league position. Although the Glovers head to Kenilworth Road sitting third bottom in the League Two table, just three points above the drop zone, new boss Darren Way has seen results pick up immediately since taking over on December 31, with three wins from four league games. They enjoyed a 3-2 triumph at AFC Wimbledon on Saturday to move out of the bottom two as Jones said: “It will be a tough game, don’t look at the league position, because I promise you that will defy their performance. “They’ll be fine this year, Yeovil will be fine, we know what to expect from them, trust me, I’ve watched them enough lately. “I went down to watch the Carlisle game, saw three games before Christmas and watched the last three games on DVD. Jones, himself an ex-Yeovil player and assistant manager, felt it was no surprise that his former side had picked up under Way, who he was team-mates with at Huish Park. Way also returned to play when Jones was assistant boss at the club, as the Luton chief continued: “He’s a good friend of mine Darren, been through some good times and some tough times. “He’s done unbelievably to be where is, to be alive in fact because he had almost a fatal car crash, it just ended his playing career. “But he fought, he’s a fighter, his team’s the same as him. If you look at his teams, they are him, and he’s done fantastically well there, he’s someone I know really well and class as a good friend. “I watched them a few time under the previous manager and they’re a different side now, a totally different side in how they go about their games. 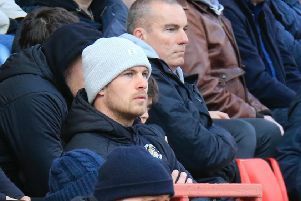 Jones was also more than aware of some of the players that Luton will come up against this evening, due to his links with the opposition, adding: “Chris Weale is sub goalkeeper there, I played with Chris, I played with Ryan Dickson, who’s left back there, and Nathan Smith, I think both of them were actually brought into replace me. “I know a few of them, the boy (Kevin) Dawson, Simon Gillet, so I know a lot of the players they have there and they’re a real tough test, I promise you that. “It’s a great club, I have real fond memories of seven years there as a player, player assistant manager, and really loved the place. “I settled there, met a lot of good people at the club. They’ve had a lot of highs, a few lows lately, but they’ve got some good people in charge now and definitely picked up.